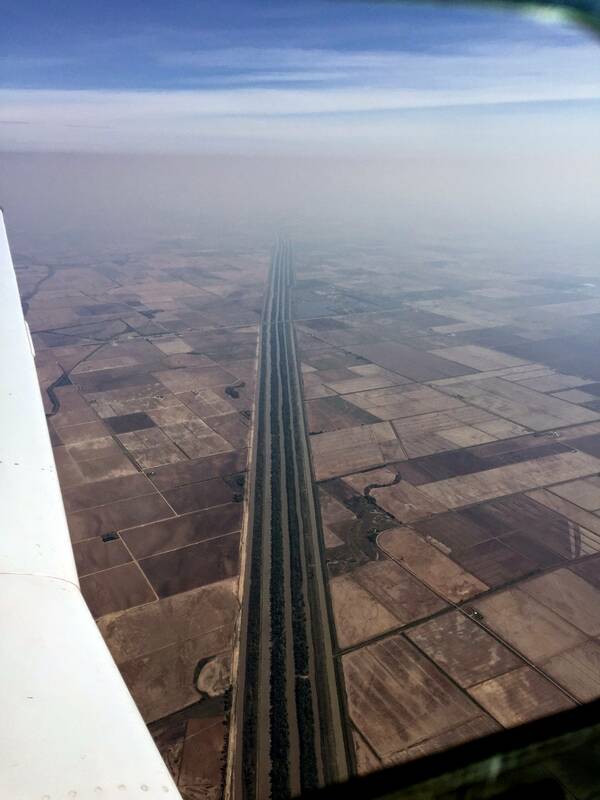 Flyover Country is a free app that correlates geo/paleo databases, maps, and other data sources with your phone's GPS to provide information and identification about the landscape below as you fly over it - no wi-fi necessary. Interested in learning the land features or geology after a flight in the U.S.? The USGS National Map Database provides a mapview site in which you can look up geologic maps, publicly available papers, and topo maps; it includes a satellite view from which to start. Example: Half Dome in Yosemite National Park. --Macrostrat: "a community resource for the addition, editing, and access of new macrostratigraphic, lithological, environmental, and economic data." --Neotoma Paleoecology Database: an "online hub for data, research, education, and discussion about paleoenvironments"
--The Paleobiology Database: "global, collection-based occurrence and taxonomic data for organisms of all geological ages"
This is way better than what I usually do, which is take a picture out the window, note the time, then when I land compare with FlightAware (or any other flight tracker), get a sense of where the plane was at that time, and then scour satellite imagery until something looks right. Anyone else have difficulty with GPS lock in an aircraft? I do. Awesome idea though. Yeah, I can almost never get a GPS fix while riding in a human mailing tube. Holding the phone up to the window doesn't seem to help. This is the wildly futuristic consumer product that I believed I would see in my lifetime. It's here! Anyone else have difficulty with GPS lock in an aircraft? I've never been able to get an initial fix in the air the few times that I've tried, but if you get the initial fix on the ground, your phone can use the cell network to get the initialization data much more quickly. From there, I've been able to keep a fix through an entire flight. I've wanted this for so long. Literally since I started flying. As it happens, I'm on a layover in Midway right now, so I might be able to try it out later today! If it's during the day, with no cloud cover, I spend most of the flight with my face plastered to the window. At home, pretty much on a weekly basis I spend hours just looking at Google Maps (or Earth). I have a very clear and significant memory from my childhood of discovering that my paternal grandmother and I shared a love of maps, when it hadn't ever previously occurred to me that other people loved looking at maps. All of which is to say that this is just my kind of thing. I got this app a little while back but haven't flown anywhere yet to test it. I've spent a lot of flights doing my best to memorize some interesting-looking landform and then trying to track down what it might be, so this kind of thing is perfect. Wow, an app I would actually want to use! Maybe it's time I got one of these smart phones everyone's been talking about. The last time I flew I had my iPad and the plane had WiFi and it was so great to be able to use Flightaware to track my progress. It was occasionally a few minutes behind, but it was close enough that I could identify almost any town I flew over. I've flown cross-country enough times to accurately identify things like Lake Tahoe, the Black Rock Desert and the Grand Canyon. It gets a little dicier when it comes to the great lakes since they are, well, enormous. If it's during the day, with no cloud cover, I spend most of the flight with my face plastered to the window. I was miserable when I took a Lufthansa flight from LAX to Frankfurt a few months ago, and as soon as we took off, they told everyone we had to close the shades. I flew from Toronto to Vancouver once, and the only thing the pilot said over the intercom during the entire flight (other than the standard takeoff/landing messages) was "If you look out the [left/right] window you'll see Kenora." And then everyone on that side of the plane craned their necks towards the windows as though there was much of anything to see. I figured it must have been an in-joke or something. I used to always get on planes with one of those big (awkward) map books and try to follow where we were, it was fun to have clouds below, so I'd not know where we were, then have the clouds open up and try to figure it out from the landforms. Flying over the american west is fascinating - lots of cool bits of geology to look at. It's been posted a few times to MeFi before, so I couldn't justify making an FPP when I discovered it recently, but if you're reading this thread and you haven't seen flightradar24 yet you should check it out. It seems to take it a while to "get the data flowing", and I don't know what it's like on mobile, but I've spent hours zoomed in to a busy airport clicking and tracking various flights. oh my god, so much yay!!! pretty much all i do on planes is stare out the window and try to figure out where i am (or take photos with my phone and then check the location data in the camera roll after I'm connected to wifi again. this is going to be SO MUCH BETTER. Can't wait to try it out when I fly to Alaska next week! ...as soon as we took off, they told everyone we had to close the shades. I retain a lot of childhood bitterness from when I was forced to close my shade so they could run the drop-down three-light movie projector, and I couldn't look outside at this familiar-yet-foreign landscape like a god. Dudley Moore in Arthur. Him cackling for hours. God, I'm still so angry. I discovered, to my delight, that Aconcagua — the highest mountain outside of Asia — is only about 65km NNE of Santiago. Book a left window seat when flying from North America to Santiago or a right window seat on the reverse trip. I was on a flight this weekend remarking to my girlfriend that I wanted exactly this app to exist, without knowing that it already did. Today is a good day. Thanks, MeFi. I've wanted this for a long time. I can't tell you how many times I dreamed of this app while flying. This goes double when I'm flying with a friend or partner. "Is that the Great Lakes" "Are those the Rocky Mountains?" "Is that San Diego?" Lets put on a movie with a messy plot so you can ask me different questions I don't know the answers to for a change up. I figured it must have been an in-joke or something. Over a year ago I was on a red eye flight headed east from SF. The aircraft I was on was brand spanking new---it had those air bags on the seat belts in the exit rows. Anyway, it also had the coolest in-seat map/progress software which allowed you to change POV: starboard, port, or forwards. Since the flight was empty, I sat in the middle seat of my row and set all the displays appropriately to provide a map "panorama." If you ever get the opportunity, highly recommended. I'll see you next time, weird slabs of Arizona, just see if you can keep your peculiar igneous or whatever secrets from me. I've had that map program on several flights too, but on fully half of them it never aquires the plane's location data and is useless. I'll be damned if the ability to buy movies ever fails, though. Anyway, on one flight from LA to Chicago I saw a bright shining sun reflection in the distance that I assumed was Las Vegas. With this app, no assumptions are necessary! I'm totally taking it with me next time I'm flying. I'm looking forward to being able to identify all the tiny patches of light in the Rockies when I'm flying over, always frustrates me not knowing. Oh yes. Time to download! exogenous: "I can almost never get a GPS fix while riding in a human mailing tube. Holding the phone up to the window doesn't seem to help." You need to be in a equatorial facing window (and not under a wing). I've got lock on many flights with my D30 while in a window seat but only when the plane was oriented where I could see south. Mind you that is also in barely a plane Dash-8s and similar. It's easy when it's something distinctive like Cairo, Illinois or the Great Salt Lake or the Finger Lakes. But, when it's giant chicken sheds or oil field pads (seriously, they're everywhere) who knows? This looks like fun. I always want the window seat. This is almost word for word something i imagined as a kid, sitting on a plane with my color palm pilot full of emulators and crap. I remember telling my dad "what if you could just look up what was out the window!" I guess it only took like... 16 or 17 years. Anyway, on one flight from LA to Chicago I saw a bright shining sun reflection in the distance that I assumed was Las Vegas. Awesome. I'm doing the Atlanta to Boston hop tomorrow, and this will be useful. About ten years ago I flew from Boston to Sacramento. It was with Virgin and they had inflight Google Maps access. It made for an absolutely fascinating flight, especially since the skies were clear the whole trip. I just stared out the whole time and compared it to what I saw on the map. This is clearly the next step from that. I had never been on a cloudless daytime flight until earlier this year when we came back from our honeymoon (mexico to canada) and I was like a drooling zombie out the window the whole time. It's so amazing, and I was the person annoying MiltonRandKalman for sure. "what's this city do you think?" "do you think this is a national park?" Yep, deleting Miitomo to make room on my phone for this. The flight that went right over Yosemite Valley was one of those where I was really excited and my seat mate could not have cared less. A different California flight went right over a crazy reservoir that took me like three hours in Google Earth to find later. I am very much looking forward to using this in the future. Mitheral: "You need to be in a equatorial facing window (and not under a wing)." Mitheral: "Mind you that is also in barely a plane Dash-8s and similar." I tried it out this afternoon; and it didn't work for me. The "save offline" feature errored out every time I tried to save, so I have nothing to report. Also, this might have been because I was in Chicago while testing it, but the Wikipedia points of interest were too numerous to be useful. But it definitely shows promise. I'm looking forward to trying again Friday. Ya exogenous, I knew it could be a lot worse. Actually the Dash-8 isn't the smallest plane I flew regularly. That honour is reserved for the Beechcraft 1900D which only has a single row of seats on each side and a nice hump half way down the isle that lets you smack your head on the ceiling. I actually like those better because no seat mates squishing you. OK, time to book a flight. I am just about to fly from KL to Beijing, sitting at the gate right now. The Big Country is my airplane song, been singing it to myself on airplanes for more than 2 decades now, and wow it fits this thread so perfectly. Tearing up a bit... wish me luck! 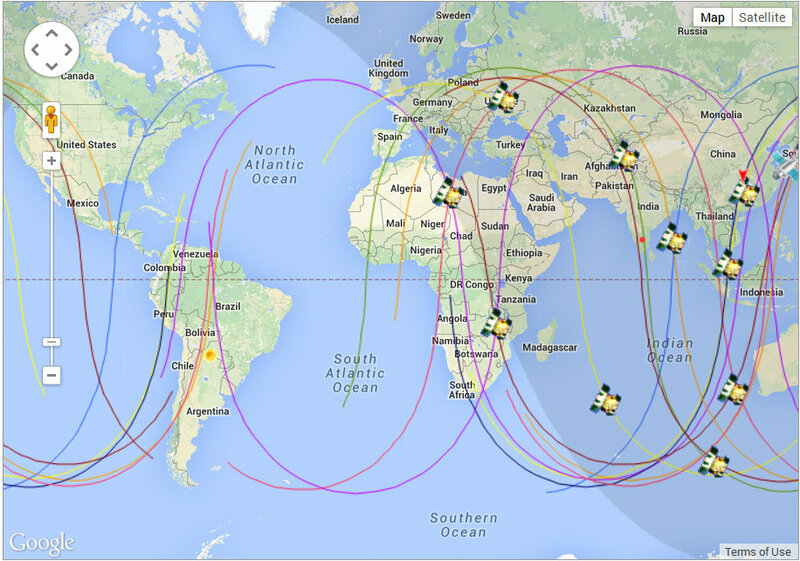 When you are up at the top of the loops on this map there are way more satellites visible to the south than otherwise. Empirically I only ever managed a lock when I could see mostly South. Woohoo! I am going to be on planes so much this month and this will be fantastic. I just flew from Knoxville to Minneapolis - took off at 6:45 AM, sun just about to rise over the mountains, crescent moon hanging right overhead, the more distant peaks peering out of the mist like islands in a river of fire. Obscenely, ridiculously beautiful. I tried to use this about ten days ago, for flying from London to Frankfurt to Narita, and was pretty disappointed. Because the map file was so large I had to hold onto the phone and keep tapping it to stop it sleeping for about half an hour in order that it could download (and this was using just one map layer). Then, when we took off, it didn't seem to work at all! Of course, this flight was mainly in the dark and over Russia, so not heaps to see, but I was still hoping for more. Maybe I just didn't start it up properly? Or is it better suited to shorter journeys? I'm really eager to hear more from people who get to try this. I sent it to all the people I knew would be traveling before I posted it, and they've reported about an 80% rate at getting it to work - so far it seems to work best in the western U.S. - and as some people have alluded to, the larger the file it needs to download before taking off, the more trouble they had. From what I've heard (in the geo gossip circuit) the makers really want to improve it, and so the attention will help a lot to get it there, so I'm not going to despair if it has some trouble out of the gate. This won't work if you (are flying commercial and) actually follow the rules and put your phone in Airplane mode, correct? Because that turns off Cell and GPS. The whole "you don't need Wifi" just means that the data is stored in the phone, but you still need GPS and/or cell tower hits to provide location. Why does the TFA not mention this? I suppose you could selectively turn off cellular and leave on GPS, but that's skirting the rules. This reminds me of a time many, many years ago I was on a flight from San Francisco to either Kansas City or Chicago. An Asian woman was sitting in the row in front of me, window seat, and she was really transfixed looking out the window the whole time. Somewhere over Kansas she turned and asked me, in very broken English (I guess she was either a tourist or at least had not been in the US long) about what she was seeing: "the squares are farms, yes? But, please, what are circles?" I had to try to explain how those, too, are farms, because of the sprinkler machines that move in circles. Does my phone's GPS work in Airplane mode? Is it legal? Your phone is only receiving GPS signal (sic), not transmitting anything, and so it's safe and legal. Enabling airplane mode does not turn off your GPS (unless you're running iOS 8.2 or earlier). This is me! I am the target audience for this. Flying frequently for work and looking out the window has turned me into a geology nerd. 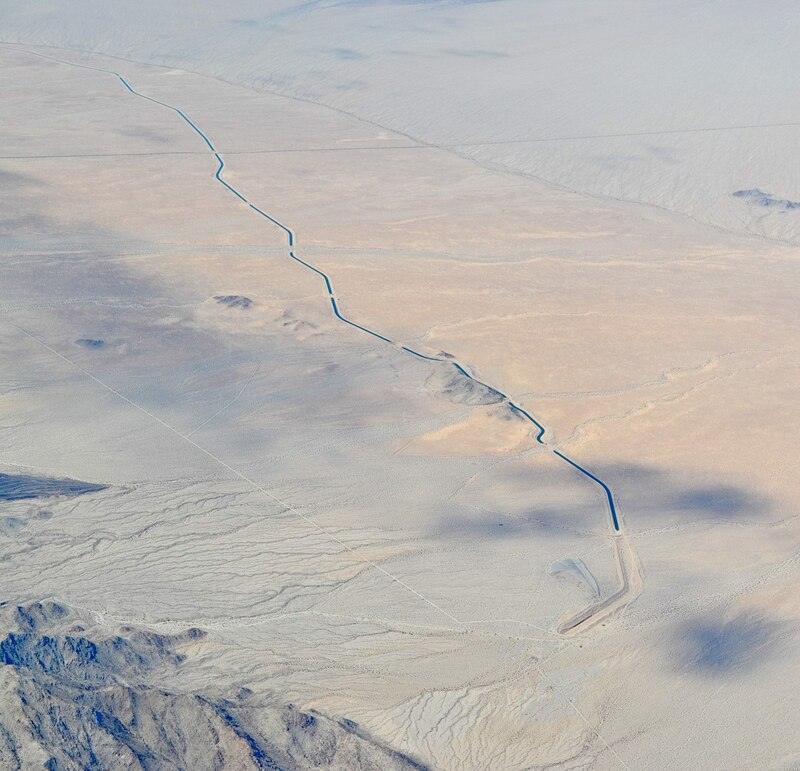 There is one specific landform that I've seen when flying from NY to the southern CA the last few years and i really want to know where it is and what it is and how it came to be. I just got off a plane a couple of days ago flying to SF and saw new things in the Great Basin that i've never known existed. The idea that i can find out what these are and go and see them in real life sends me over the edge with glee. Although Im sure my phone and OS are too old for this app i finally have something to look forward to in life. dnash: " I had to try to explain how those, too, are farms, because of the sprinkler machines that move in circles." As featured in these askmes. One of the more interesting things I've seen is from the air is this. It took a while to figure out exactly what it was because, by the time I'd started investigating, I only had a rough recollection of where I took that photo. Also this in Missour, part of the Little River drainage. I'm trying to download a map and it doesn't seem to be working. I picked all the tiles and it estimated 240MB which is not a huge amount of data but now it's just sitting there with a progress bar that hasn't buged in forever. Hm.